Killer catch here in the name of Darren McFadden- a player at Arkansas who frequently drew comparisons to Adrian Peterson and Ricky Williams. The first Sophomore to win the Doak Walker award (2006), McFadden did so in stellar fashion running for 1647 yards and 14 TDs . He then became the first 2 time winner rushing for 1830 yards and 16TDs in 2007. In both years he was a Heisman Trophy Runner Up. McFadden’s draft measurables were equally sizzling and buzz surrounded his unofficially timed 4.27 40. 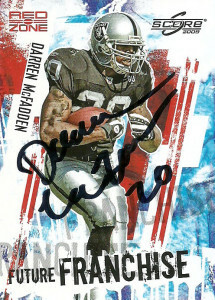 The Raiders selected McFadden with the 4th pick of the 2008 draft, and although he played sparingly his rookie year he drew high praise from coaches in teammates alike. It has always seemed that Darren’s best games have come at the expense of the Denver Broncos during his time with the Raiders, including a 16 carry 165 yard performance with 3 TDs in 2010. 2010 was considered McFadden’s banner year. He ran 223 times for 1157 yards and 7 TDs to go along with 47 receptions for 507 yards and 3 TDs. Over his career in Oakland, McFadden had not been able to clear a full 16 game slate. After the 2014 campaign he was allowed to walk. Darren signed with the Dallas Cowboys where he has slowly moved into the role as the bellcow back replacing departed starter DeMarco Murray. Facing a crowded backfield and dealing with nagging training camp injuries, Darren has put together 5 solid 100 yard rushing efforts against the Giants (152 yards), Eagles (117 yards), Dolphins (129 yards), Packers (119) and Jets (100) in 2015, and in the last game of the season crossed the 1,000 yard rushing plateau for the first time since 2010.